In a perfect world there would not be any rules to live by. There would be no need for control and the accompanying restrictions. Children would automatically be mindful and respectful of their parents. Drivers would instinctively govern their speed and conduct on the roads, etc., etc. Life, however, is not perfect and the powers that govern us determine the rules necessary to live by. Occasionally there are rules created in the Golden Ages that have made complete sense to the governing agent. Aviation, and resultant aviation law, has also evolved immensely since its inception from the progenitor of flight, the hot air balloon, to today's complex aircraft and spacecraft. I really find it hard to believe that the ancestors of aviation envisioned the magnitude of aircraft and pilots that there are today. Regulation of aircraft and pilots, as we know, has been a constantly changing issue. The necessity for more regulation arouse as air commerce evolved, for the safety of passengers and people on the surface and to provide guidance and direction for the pilot. In 1926 the Bureau of Air Commerce developed from the Department of Commerce's Aeronautics Branch. Then in 1936 the Civil Aeronautics Authority (CAA) was developed to control certification of air carrier routes, and Air Traffic Control was born. The year 1940 brought the split of the CAA into the Civil Aeronautics Board and the Civil Aeronautics Administration. With the split came the advent of governmental control of airman, safety enforcement, rule making, and accident investigation. As the aviation industry grew, regulation became increasingly necessary in part because of the sheer volume of aviation activity. In 1958 Congress gave the Federal Aviation Agency sole responsibility and authority to regulate and enforce the regulations. And the Federal Aviation Regulations are constantly changing to keep up with safety requirements of a continually growing aviation industry. In 1967 the Federal Aviation Agency was placed in the newly created Department of Transportation and renamed the Federal Aviation Administration. In order to tell the whole story, statistics from 1994-1995 can show us how large aviation has become since its inception. Statistics show that there are 639,184 active pilots in the U.S. alone. Two hundred and fifty seven thousand, eight hundred and fifty seven (257,857) of those active pilots are Commercial pilots or ATP's working for a living in the aviation industry. That's a whole lot of people relying on 170,000 aircraft to get them safely from point A to point B. Those same 170,000 aircraft logged an estimated 24,000,000 hours of flight time in one year. Speaking of points A and B, there are 18,224 airports in the U.S., including Alaska, and only 447 of those are controlled airports-have operating control towers staffed by air traffic controllers. Here in Alaska we have eight controlled fields and approximately 1,100 identified landing areas. In addition there are lakes and outlying strips in all states that are not officially counted but used all the same. Referring to the statistical information above, it becomes obvious at this point that most air traffic control is "do-it-yourselfÓ in nature. 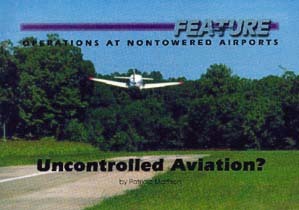 Air fields that had no positive control were at one time referred to as "uncontrolledÓ airports. "AHA!!! !,Ó thought pilots, "An uncontrolled airport, huh!? I can do pretty much what I want. "So the FAA changed the name, and with the name change, the connotation, to nontowered airports. (Nontowered refers to either airports that have no operating control tower or airports during the time when the control tower is not operating.) By doing so the responsibility of control was delegated to the users. Through the use radio contact on a Common Traffic Advisory Frequency (CTAF) and heightened traffic scanning at any given field, aircraft in the vicinity of that field can determine traffic flow and other information necessary for safe takeoff or landing. In the event that a CTAF is not designated at an airfield, the multicom frequency listed in the Aeronautical Information Manual (AIM) should be used. Even though there is no Federal Aviation Regulation directly requiring communication at a nontowered field, the AIM gives pilots guidance in that area. The pilot becomes the controlling influence, and the subsequent responsibility of safety rests with the pilot. Most of us received our first flight training either exclusively or in part at a nontowered airport. There we were the captain of our own ships, the masters of our fates. And when we were students we were probably the most diligent pilots we would ever be in our entire career. Everything was done by the book. The FAA Regulations and the AIM were our aviation bible, the good book by which we ate, slept, and dreamt aviation. Flight to a nontowered airport gave a sense of freedom and adventure but implied a responsibility as well. We followed the rules to the letter. Approaching the nontowered field, attempting to sound professional, we reported on the CTAF inbound, then again on a 45 degree entry at pattern altitude, at the downwind, base leg, and final portions of our landing. Departing the field we reported our departure position and proposed departure path. We, as student pilots tried to do our best and to do it all by the book. Perhaps our instructor was within earshot, or it could have been that we were excited and amazed at hearing our own voice in the headset. Whatever the driving force, we did it right. So what happened to the attention to detail when we became "Real PilotsÓ???? Suddenly it appears that all that valuable training flew right out the window. Radios were turned off at nontowered airports. Nonstandard patterns were improvised on the spot. It seems a few pilots have forgotten the common sense and the courteous attitude required in the nontowered environment to assure safety. For example, straight-in approaches, common at tower controlled fields, can be a real problem at a busy nontowered field. Several years ago, when I had a Cessna Pilot Center, I was out doing touch and go landings with a relatively new student pilot. It was a cold-as cold as Southern California gets-overcast day. The cloud bases were at 1,500 feet, and aircraft had been making the VOR approach, circle to land, to the field most of the day. My student was making all of the appropriate position reports on downwind, base, and final, as well as announcing that we were going to make touch and go landings. At one point we had turned to final approach and were well established on the approach when I heard, from the ground, "Patti, make an immediate left diving turn, NOW!!! "Recognizing the voice and the urgency, I instinctively complied. A twin Cessna that had been on a long, straight in approach flew past within feet of us, narrowly missing my plane, and landed. Had I not automatically reacted we would have been involved in a mid-air collision with the twin. A quick thinking former student on the ground in the run-up area had the presence of mind to alert us of impending danger. As a result of that warning my student and I avoided becoming a statistic. Later, after I quit shaking-not out of fear but with fury-I went to the pilot of the twin. I read him the riot act, loud and long, about announcing position and listening on the radio for traffic in the pattern. Comment from the pilot was that it was legal to land from that approach. Legal, it might have been, but not a safe thing to do at a nontowered field. There is no way a pilot can get a good view of traffic in the pattern while on a straight in approach. See and avoid is still the best policy. By flying a circle to land maneuver, from a straight in approach, while remaining at an altitude above traffic pattern altitude, opportunity is given to other aircraft in the vicinity to observe your airplane entering the pattern and react accordingly. Always keep in mind that, like the danger to your car in a parking lot because of increased traffic, most accidents happen in the heavily trafficked vicinity of an airport. Another situation that can cause an accident, especially at nontowered fields, occurs during the 45 degree entry to downwind. To descend while entering the 45-degree courts disaster. When two aircraft are entering the downwind, a pilot may not see another aircraft. If one aircraft is low wing and one high wing, the possibility of impact is heightened. The best plan of action would be to slow the aircraft to pattern speed and descend to pattern altitude before arriving at the 45 degree entry to the pattern. Once in the pattern at the downwind position, remain vigilant for other traffic and expect the unexpected. Report your position along with your intentions, i.e., downwind for touch and go, full stop, etc. In addition to reporting each turn in the pattern, it is imperative to keep constant vigilance for other aircraft. The traffic pattern is one place where paranoia is indeed the height of awareness. On the road this heightened state of awareness is referred to as defensive driving. The traffic pattern is no place to become complacent. If you have passengers onboard, ask them to become part of the crew by looking for traffic and alerting you to that traffic. This same advice is sound while taxiing on the surface. Surface communication is as necessary at a nontowered field as it is at one controlled by a ground controller. Announce your position on CTAF when you taxi out of a tiedown area. Inform area traffic which runway you intend to operate on. Communication, while taxiing will facilitate initiating correct reactions from other aircraft in the air as well as on the field. Taxiing towards a desired runway only to find that another plane is taxiing in the opposite direction can result in a very confusing situation. I have had the experience of being nose to nose with another aircraft and not having the space to turn on a very narrow taxiway. Playing a game of chicken in an aircraft is no fun and stupid as well. After stopping on the taxiway, one of you has to get out and manually turn your airplane. Such embarrassment can be avoided by complete communications. Announce your intentions on CTAF before beginning your takeoff roll, then wait a bit for a reply. Turn your airplane towards the oncoming traffic and take a good look for traffic in the area. Be prepared for an unexpected maneuver and allow sufficient time for spacing for arriving aircraft. Small aircraft close in can appear to be larger aircraft at a greater distance. Unless you are sure of the size and speed of the landing aircraft, wait for that plane to land and taxi off before beginning your takeoff roll. I have seen aircraft taking off in tandem. A consideration with regard to tandem takeoff that I have always had is, what happens if the lead aircraft has a problem and comes to a stop on the runway? Would the aircraft in trail have a sufficient amount of time to stop? Just food for thought. The Aeronautical Information Manual (AIM) tells us that the correct way to depart an airport is to continue straight out or exit with a 45 degree turn toward the crosswind to depart the area. It is amazing to see the variation of departures, unannounced, that pilots can dream up. A normal departure for a pilot I knew of was to rotate as soon as the plane would fly and immediately execute a hard right hand turn perpendicular to the runway. The fact that there was a grove of trees along the runway edge was of no concern to that pilot; that is, until he hit them. Fortunately, the pilot wasn't hurt, but the aircraft was in ruins, never to fly again, and the air blue from expletives. Departing the area in a climb attitude reduces forward visibility. "SÓ turns on climb out increase forward visibility and are a good practice. In the vicinity of an airport arriving and departing traffic can be heavy. Keep track of other aircraft positions through communication. Contact aircraft in the vicinity in the blind on CTAF or other designated frequency. Report leaving the area, include your position and altitude. Who knows, another pilot may be entering the area at your position. Another significant situation at nontowered airports is these are where the aircraft without radios are likely to be found. Whether they are homebuilts or antiques, our flexible Federal Aviation Regulations allow aircraft to operate without radios. The pilots of these radioless aircraft do not have an important anticollision tool-communications-but they do have a good set of eyes and must use them. Adhering to standard traffic pattern procedures is important for all concerned at nontowered airports, but it is especially true for aircraft without radios that cannot make position reports on CTAF. I am sure that there is a plethora of advice and information on flying in the vicinity of nontowered airports that you have heard from instructors and other fellow pilots throughout your career in aviation. Experience is always the best teacher. We learn experientially during each and every flight. Whether the experience is a good or bad depends on how well we follow the rules. The rules, the Federal Aviation Regulations, the AIM, common sense, and courtesy serve us well. If we all try our best to be competent pilots, flying defensively and not allowing complacency to enter our lives, it stands to reason that we will be safer pilots overall. As my father-in-law, once an Army Air Corps pilot, always tells me, "Fly safe, keep your eyes open, and your head on a swivel.Ó Good advice from an old, not so bold, pilot. Ms. Mattison is the Safety Program Manager at FAA Juneau, Alaska, Flight Standards District Office. For information on pilot operations at nontowered airports consult Chapter 4 of the AIM.